I have never seen lengthwise joists like that before. Same here, although that didn't occur to me till U mentioned it, Brad. 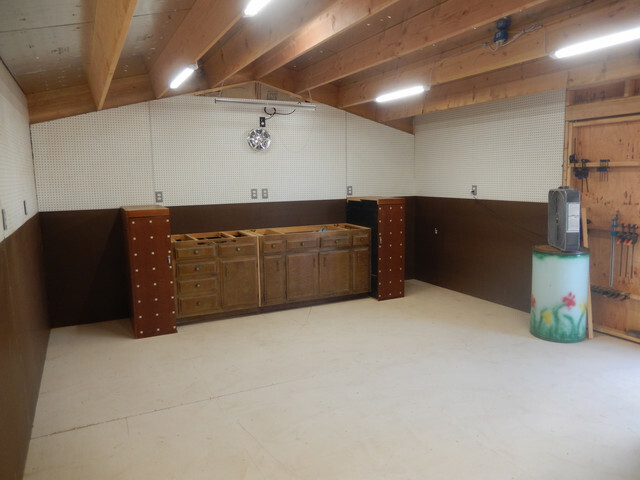 Lovely work-space, more like a "barn" than a mere shed. LOL. And, during the winter, I can't ice skate, in my shed either ! Boom! Boom ! I only had my imagination, as to how to set up the shop. Reality quickly set in and some things just didn't fit as thought. So I've put everything in 'temporary', so I know what will fit where, and how the 'work flow', is most efficient. 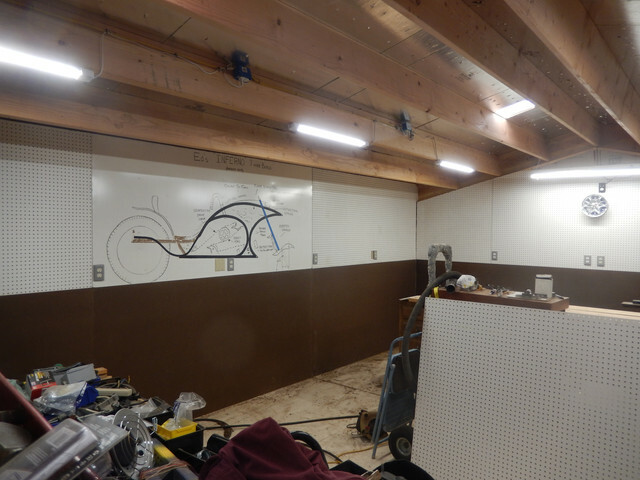 Soon things will have to be moved out from the walls, and insulation, and pegboard put up. 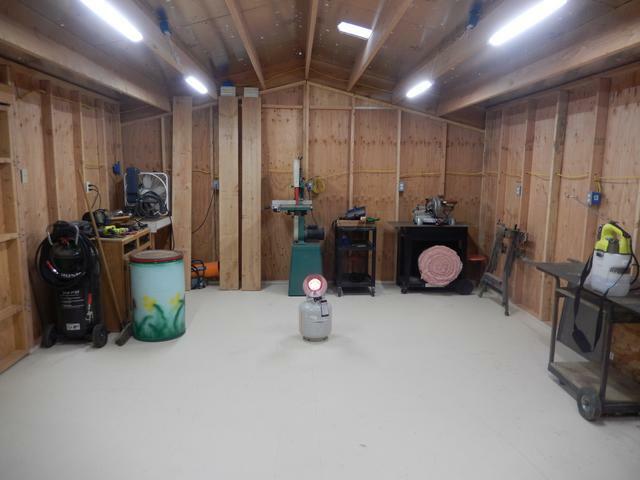 I can warm it up well enough, with my propane heaters, but cooling in our summer heat, is another matter. My other sheds are fully insulated, and the evaporator cooler just makes it, 'ok' but not real comfortable. 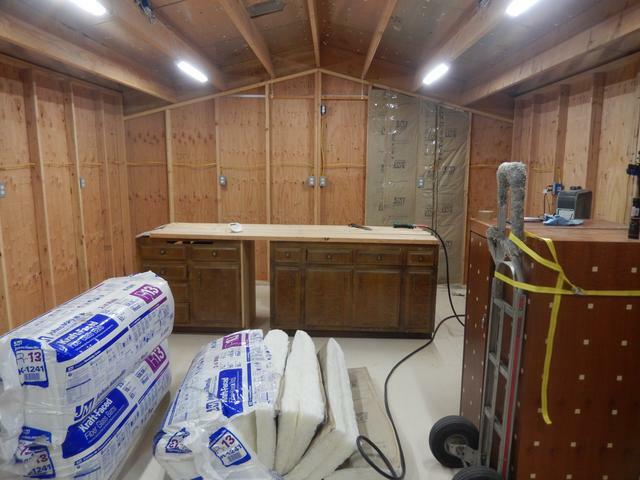 I will be using those cabinets for storing all my power hand tools. If you notice the red Budweiser cans in the background, they were 'donated', to the StreetRunner build, for the faux carburetor setup. I don't drink beer, though I have enjoyed a good ale, at 'The Fox', in Finchingfield, Essex, while I lived there. Need ramps to roll in or out anything of size. two (8' x 2" x 10") on the back wall. for getting the shop quick heated, when the temp is down near the 30's. I learned from my previous wiring in the old sheds. I placed the outlets too low, and they were always hard to get to. This time I mounted them at 5'. 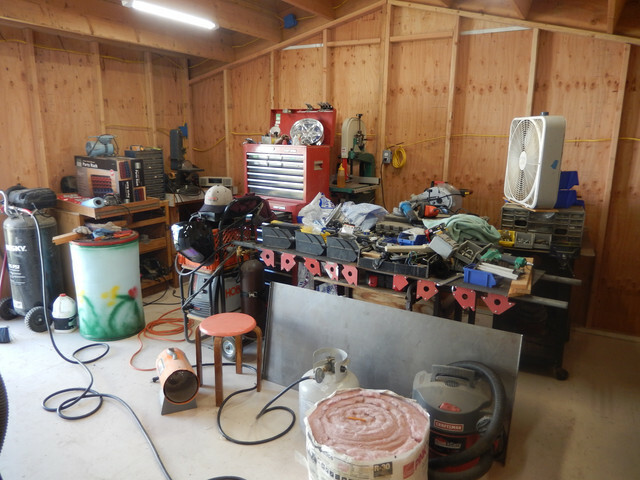 Except for the cabinets, band saw, and drill press, everything is on wheels, so I'm able to have fluctuating work space, as needed. It is the Rolls Royce of work-spaces Ed'. Ditto what DannyC said! Just a FANTASTIC work space! Wow, what a setup! Agree with the outlet placement! Had mine about that height in the "magic bus". Sure miss those days, too! Happy for ya, my friend! Most excellent, may all of your projects come together smoothly! Searched online for insulation that wouldn't break the bank. Luckily I found a out of state seller, that sells insulation at about 1/3rd less than the big box stores. 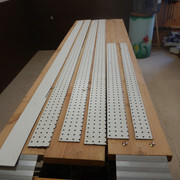 So I opted for the 15" wide, which means more work, (Cutting and splicing), but for the better price I'll do it...again! So, as you can see, I have pulled my 'temporary' set up out, and set up for a few hours of putting up insulation. 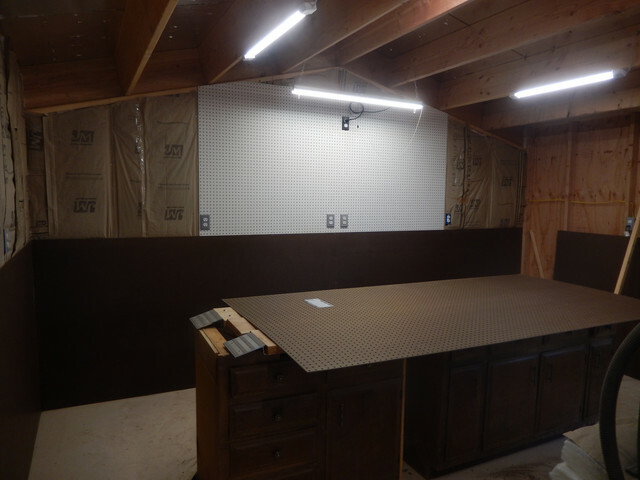 This first phase will include the end wall where the cabinets and pegboard will go, and the wall to the left. 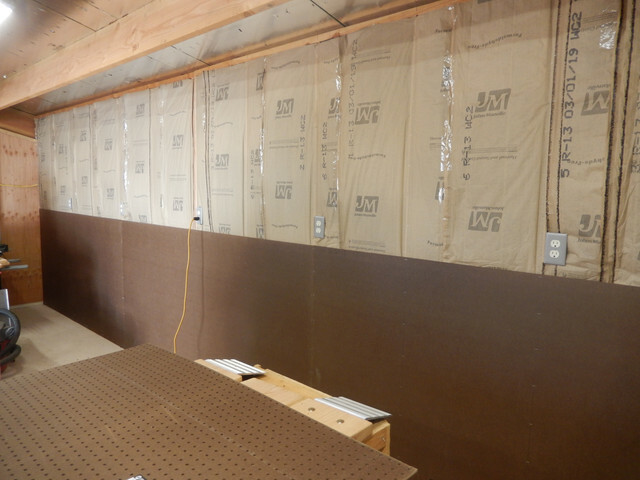 These two walls will take the brunt of the hot sun, throughout the summer, thus need to be insulated first. Not too worried about the other two walls at this time. The ceiling? .... Well with this joist configuration, I'm not sure what I want. I think the orientation of the joists, makes for poor air flow, out the roof vents. Everything moved to other end. Hmmmm, looks something like what the other shed looked like. and I just have to make sure everything gets put in its place. I have to divide my day, between working on 'projects', and working on yard maintenance. We've been in a drought, for a number of years, which they report is officially over. This last winter, and to date, we are experiencing some of the heaviest rain fall in quite sometime. Normally I may have a hand full of weeds, so I usually don't put down any weed killer. 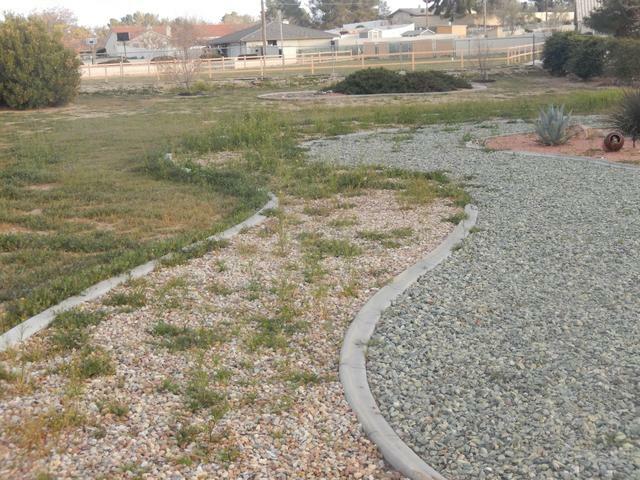 So today, starts the laborious task of weed clearance from all the front yard. I have a new sprayer, so no more 'pumping'. Will spray when all is cleared. Managed to get up most of the first phase of insulation. Have to cut and nail in, 'nail edges', for the two end corners. Full size batts installed. Next is to cut some batts in half, to fill in the remaining open areas. GREAT looking "shed" there Ed. For cooling, look into a whole house fan. When we lived in La Vern ca I installed one and it cooled the house down very quickly. I looked into your suggestion. 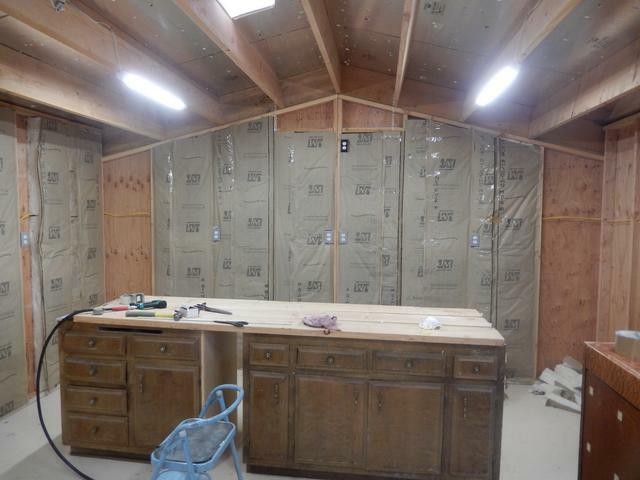 I have two vented sky lights, that should exhaust much of the heat. But with the joist going length wise, the air flow will be disrupted somewhat. I can use the whole house fan idea/concept. 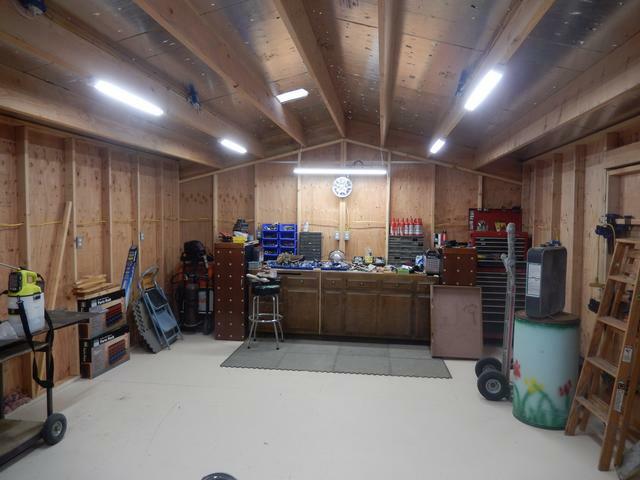 In my old shed, I could open the floor between each building, thus pulling the cool air up from under the shed. This building there is no such opening. I could run ducting from underneath and pull in the cool air, and an exhaust fan in the gable end. I won't really know what my need/desire will be until the 100 plus temps arrive. 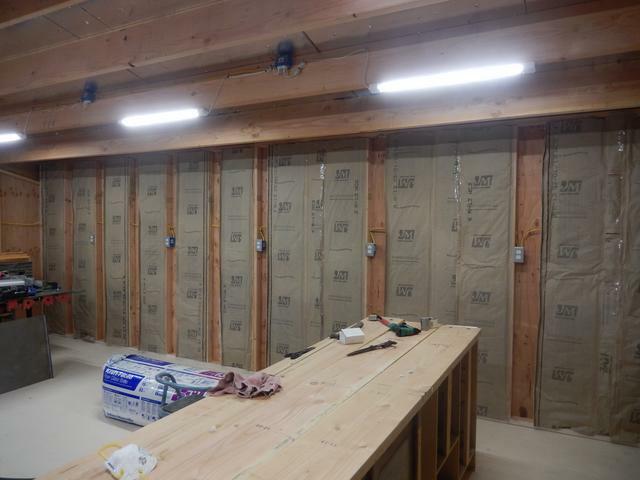 Insulating these two walls will really help a lot. 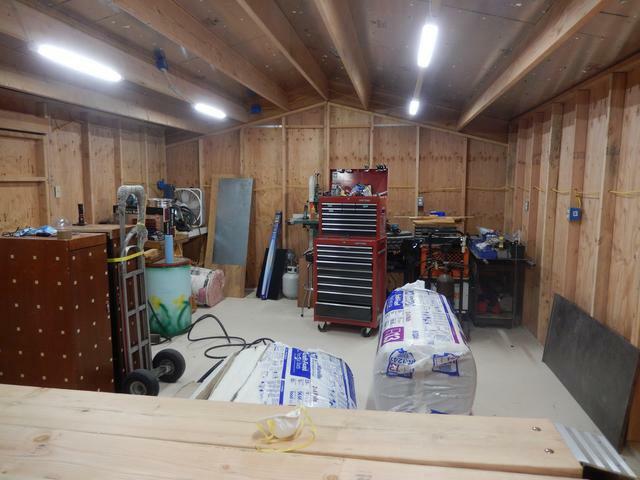 Eventually the whole shed will be insulated, as I have done with the other four I built. For now I just want to get this 'shop' up and running so I can get back to working on the Inferno and StreetRunner. Wow, add a bathroom, and you could rent that out! I think the welding and grinding would keep the tenants awake. You've heard of 'in the dog house' I'm sure. So I'm thinking maybe a 'bed' as well ? My first rule of a happy life (even above breathing) is to never end up in the "Dog House"! Started the paneling installation. I'm using 1/8" hardboard for the bottom. 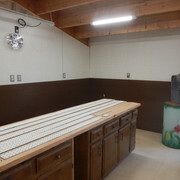 It will receive a light mint color, thus getting back, some of the lost light from the dark panels. All the top panels, will be white. Look for a 'special nostalgic' panel for the center of this Wall. 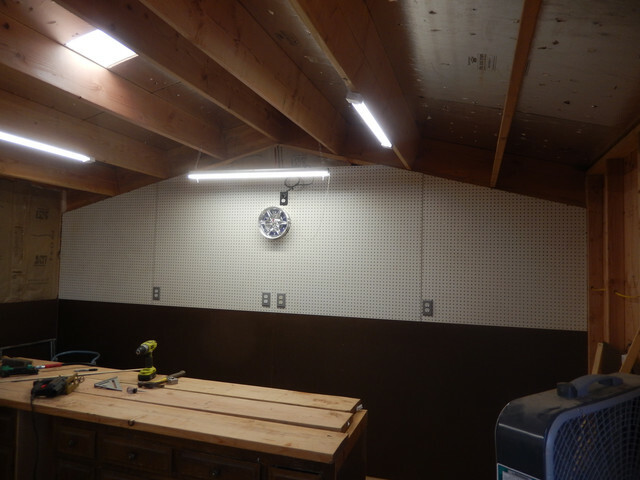 First 4 x 8 sheet of pegboard, for over the workbench area is up. Measuring and cutting out the outlet holes is time consuming. The trial and error fitting is somewhat difficult, by myself. Workbench end completed sans some trim pieces yet to go up. It's just after 5 pm. I think I'm done for today. REALLY ! I do have a place for all this. I used.. imgbb.. to load these. Seems to be quite easy. Not sure if I will stay with them or not. the other day I tried uploading a pic of my proposed hubs using postimage but didn't work. Will tray again. Some darn nice work there, Buddy! Just found imgbb, sneaking in an add-on to my photo upload. Found it at the bottom of this first photo. One was for 'die dice'. When I deleted that one, a second one popped up, for 'free online dice'. Deleted that one, and so far so good. Nothing else popped up...yet. Finished with the first 10 panels, but not without errors. Soon I will be slapping paint on. I measure twice, (sometimes more), but I'm applying those measurements, upside down, and backwards. I do this with most hardboard/plywood, to minimize splintering/jagged edges, on the exposed side. There's the constant chance of getting it wrong. As careful as I'm being, I still missed on a couple of outlet holes. I will think of some clever way to hide these, 'imperfections'. So only you and I will even know they are there...right? Our little secret. The nostalgic panel as promised. I wasn't using the panel for anything, so I decided, I would save a few $$, by not having to buy a new panel. I thought it deserved a place of prominence. Sort of a reminder of when I first started this journey with AZ. Grrr, When I uploaded this photo, I found the same add-on, in the embed codes space, where the url's go. I tried to delete it, but it also deleted the photo url. I found that if I just used the backspace bar, it deleted the 'add-on' portion only, and the photo, copies without any add-on. The "artifact" was a great addition. Last side wall finished. 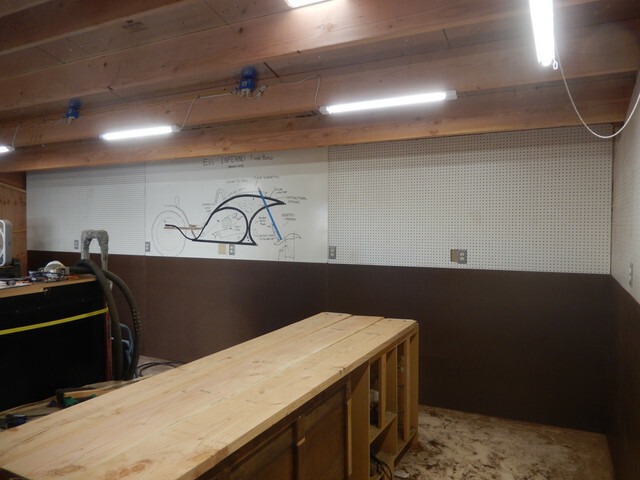 A small triangle above the workbench still remains, to be done. 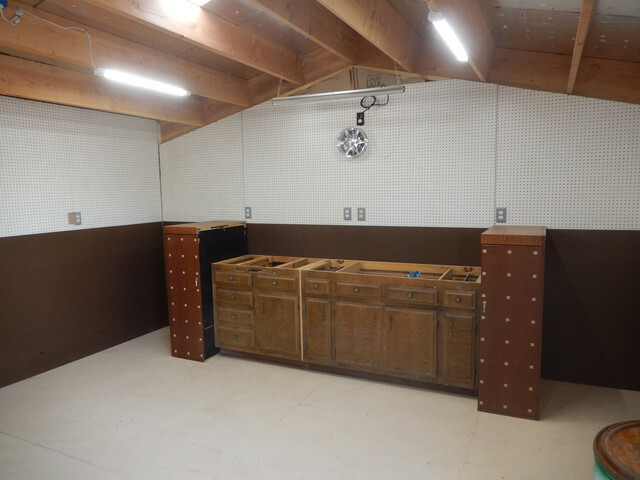 Floor is swept, and workbench/cabinets put back for now. a light color close to what is the background color on the barrel. 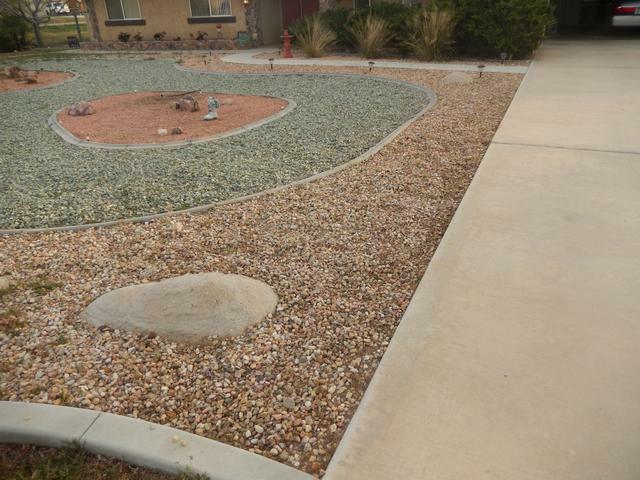 Going to take a short break from this project, and concentrate on yard work more. FYI...I think the photos, make the shop look bigger than it really is.